This is the version with the skinny cables, which don’t look quite like the logo, and without the garter sections or any shaping. July 27 – Made a swatch to clarify the cable pattern, now making a prototype bracer to see about overall fit. 19 grams yarn after weaving in ends. 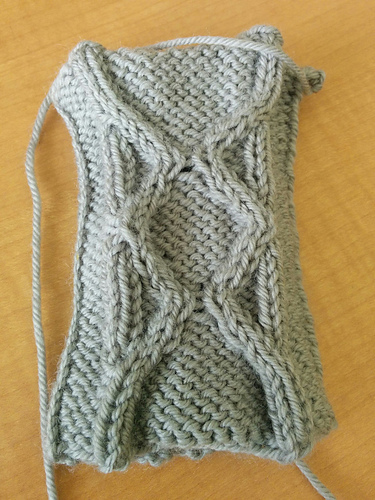 Goal for this one is to get the ribbing before/after the pattern set, and to get the shaping how I want it. Should be the final worsted-weight version.